The Clear Creek Sheriff's Office has worked in conjunction with the Clear Creek School District establishing a full time School Resource Officer to the District. The School Resource Officer serves all schools located in the unincorporated areas of Clear Creek County and has a main office located at Clear Creek High School in Evergreen, Colorado. The School Resource Officer collaborates with the school's administration and staff; investigates crime on school property; and enforces county, state, and federal laws. In addition the School Resource Officer has better communication with the community through the school setting regarding school and law enforcement issues. The School Resource Officer is also able to focus on key elements or indications to incidents that threaten or may threaten the students or school and has assisted the school staff and administration with the development and implementation of a "Crisis Plan." The School Resource Officer is active in the schools and attends extra-curricular activities, which has enabled mentoring to students on campus. The School Resource Officer has established a working relationship between government and the community and has provided positive police visibility and presence in schools. The Sheriff's Office and the School District jointly sponsor the Clear Creek Boxing Team, which is coached and run by the School Resource Officer. 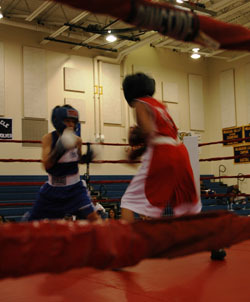 The Clear Creek High School, Middle School, and surrounding Elementary Schools are the only schools in the United States that provide a competitive boxing team. The athletes participating have trained countless numbers of hours and have become some of the best boxers in the state and region. The participating athlete's ages range from ages 8 and up. Over the past year, athletes have won Silver Glove Regional Titles, Silver Glove State Titles, Golden Glove State Championships, and Colorado State Junior Olympic Championships. The Clear Creek Boxing Team is non-profit and relies strongly on the support of volunteers, fundraisers, and donated funds.